Extensor tendonitis, also referred to as extensor tendinopathy. It is inflammation or degeneration of the extensor tendons which run along the top of the foot. 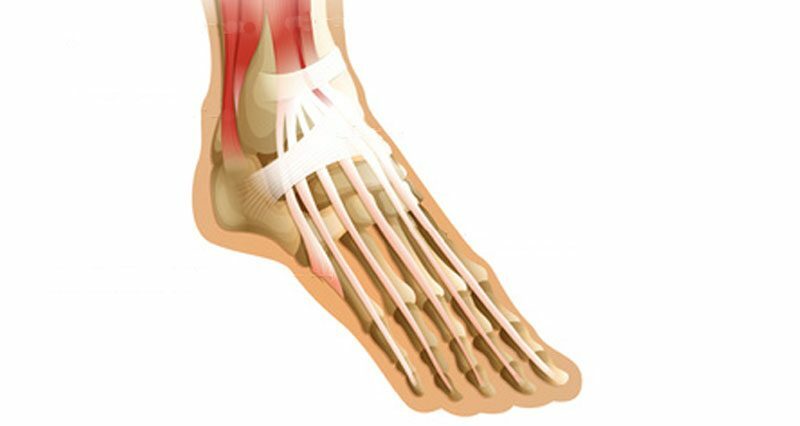 The main symptom of extensor tendonitis is pain on the top of the foot, often described as an aching pain. Pain increases with exercise, in particular running, and improves with rest. Symptoms are likely to develop gradually over time, with the athlete training through the pain. There may also be some diffuse swelling over the top of the foot. Curling the toes may trigger pain because this places stress on the tendons by stretching them. A professional therapist may perform a resisted dorsiflexion test to help diagnose extensor tendonitis. This involves getting the patient to lift the foot and toes up against resistance. If this reproduces pain then the test is positive, therefore indicating potential extensor tendon injury. The extensor tendons run along the top of the foot and connect the muscles in the lower leg to the foot bones. When the extensor muscles contract they cause the foot and toes to move upwards (known as dorsi flexion). 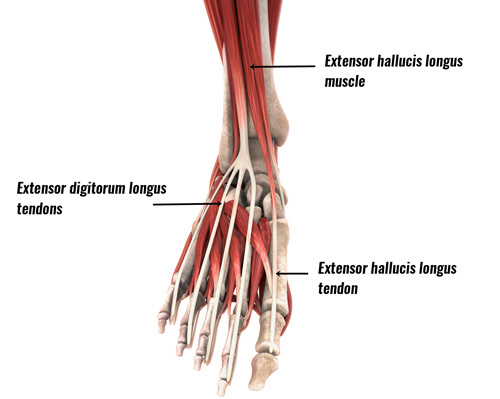 The extensor hallucis longus muscle connects to the big toe/great toe via the tendon (hallucis meaning big toe in latin). The extensor digitorum longus connects to the other four toes (digitorum means digits, fingers or toes in latin). Other tendons in the foot which also lift the foot up are the tibialis anterior tendon and the extensor hallucis brevis. Extensor tendonitis is ‘inflammation’ of the extensor tendons. The term Extensor tendinopathy is probably a more accurate description of most injuries because it also describes degeneration of the tendon. Repetitive strain from overuse can cause the tendons to become inflamed or degenerate. However, pain from most long term, chronic injuries is likely to be degeneration from wear and tear, without the presence of acute inflammatory cells. Tibialis anterior tendonitis is most common with symptoms of pain at the front of the ankle rather than across the top of the foot. Wearing badly fitting shoes, especially with the laces tied too tightly, which causes pressure on the top of the foot. A sudden change in training, particularly running uphill. Running on a treadmill allows the athlete to run for long periods on an incline, which in turn makes the athlete lift the foot higher than normal, therefore resulting in higher stresses through the extensor muscles and tendons. Running downhill the muscles work eccentrically which again places stress on the extensor tendons as can running on ice or slippery surfaces. What can the athlete do about inflamed extensor tendons? Rest until the pain has gone. Continuing to train when the foot is painful will only make the injury worse and delay the healing. If it becomes chronic or the tendon degenerates then healing will take much longer. Apply a cold therapy and compression wrap. Apply ice or cold therapy for 10 minutes every hour initially, reducing the frequency as required over the next 48 hours. Use a wet tea towel or a re-useable cold therapy and compression wrap. Do not apply ice directly to the skin as it may burn. Read more on PRICE principles. Once the initial painful acute stage has passed, applying heat may be more effective. My sure you wear appropriate footwear and in particular do not lace your shoes too tightly. Over-tightening the laces put direct pressure over the extensor tendons in the foot. It may help to try a different lacing pattern. Replace running shoes after 400 miles of running, or 12 months. After this amount of wear the midsole starts to degrade. Read more about choosing running shoes. As soon as normal walking is pain free begin rehabilitation. Perform strengthening exercises to strengthen the extensor muscles. Make sure exercises are pain free. Because this is often an overuse injury, doing too much too soon may increase the chances of the injury recurring rather than achieving the opposite result. Toe raise exercises which lift the foot up and curl the toes back will work the foot extensor muscles. These should be done in the seated position initially and will also work other muscles of the lower leg and shin. A professional will assess the injury and confirm the diagnosis, ruling out the possibility of a metatarsal stress fracture. Often pain on passive stretching indicates tendinitis, but a pain when the toes are pulled outwards might indicate a stress fracture. A doctor may prescribe anti-inflammatory medication such as ibuprofen. But do not tae ibuprofen if you have asthma. If it is a long-term problem, a steroid injection may be given although repeated injections to tendons can weaken them. In very rare cases surgery is performed. Extensor tendonitis stretching exercises are done by kneeling down with the feet pointing backward. Aim to flatten the ankles towards the floor to stretch the extensor muscles. You should feel a gentle stretch at the front of the ankle. A more advanced version is to lift the knees upwards increasing the stretch. Hold the stretch for 10 to 15 seconds, relax and repeat once or twice more. Stretching should be done at least once a day and depending on the individual three times a day may be recommended. Strengthening exercises should always be done pain-free and very gently to begin with. Toe raises will work the extensor muscles and involve simply lifting the foot up and down repeatedly. Avoid overdoing it, especially if you resume normal training. Running alone will work the extensor muscles, so tiring them out before a run is not advised.